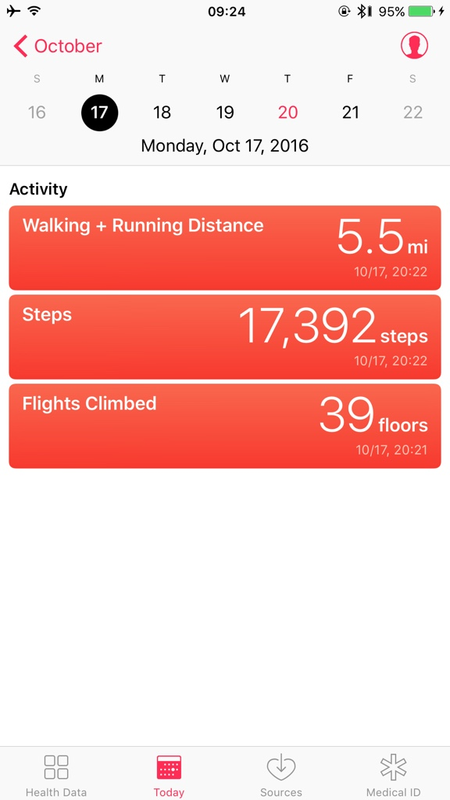 I noticed this evening that the Health App (iOS 10.0.2) shows that I climbed four flights of stairs today at 0530. That's when I woke up and picked up the 6S+ that I'm currently using in WiFi mode. The phone has not left the house since Sunday, and I live in a one story house. I did carry the phone and use it as a flashlight when walking around the house as all of the lights were off this morning. There is no elevation change in the house as its all one level. Last edited by Trees; 03-24-2019 at 08:35 AM. Reason: Tried to fix title typo, but not able to with the "Go Advanced" option. I wish I did. Currently my Health app just plain doesn't work. Sorry to hear that. I think mine is working well overall. 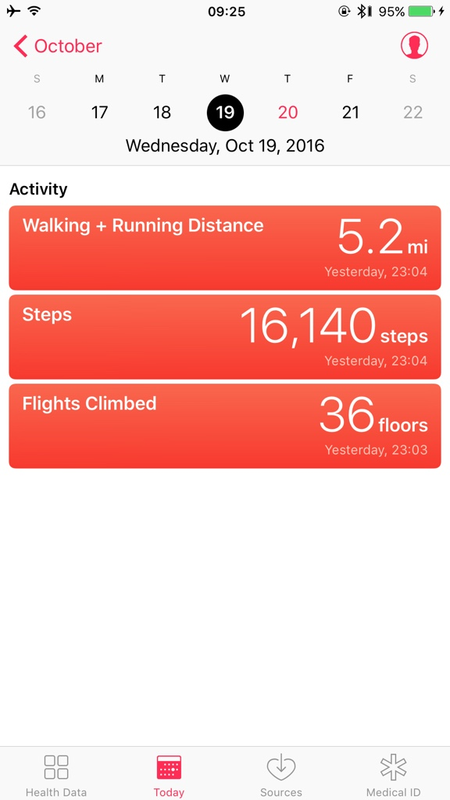 I've been using an original Apple Watch paired with the 6S+ when on bike rides and it does appear to populate the Health and Activity Apps with fairly accurate info for the Activity Ring categories. I use Endomondo to feed hiking, walking, cycling data into the Health app. So this morning's data was a bit of a surprise. My legs tell me I did more. It seems pretty accurate. I've compared it to office versus field days. Nice activity, I'd feel it too. Do you think that 42 floors is accurate? Strange thing for me is that floors are being recorded during bike rides where I'm gaining elevation. On the 15th Endomondo captured a bike ride as 170 ft. Total Ascent, with what Health shows as seven flights. Seven flights is approximately 70 ft. according to the metric described in the Health App. GPS is used by the Endomondo App, while if I'm not mistaken the Health App uses baromter. This morning the Health App shows no Flights Climbed. Pretty close. I'm commissioning a system we built and I am at the DSME shipyard in South Korea. Hump yourself up and down all day, plus my temp office is on the third floor. It was in the 30s when I went back to the hotel, I'm on the third floor and there isn't any elevators. I made at two trips up, and that was spot on. The distance, I easily walked the miles. That place is huge. 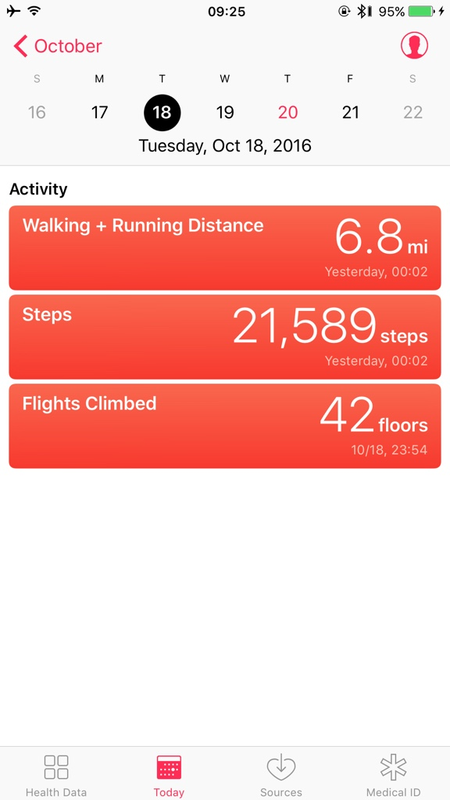 As of right now, it shows I've climb 4 flights, what I have done, is go back to my room after breakfast (three floors) and go to my office, which is another three floors. So mine is not being as generous, but I am not sure of the heights of the floors either. When I go downstairs, I'll check the readings and report back. Duh, I can't believe I messed that one up. . To get to the third floor from the first, you go up two flights, and I am now at six, which is spot on. Tried to fix title typo. Should be "story", not "storey". Why are some people receiving my texts in Chinese characters?